Promoting the magazine to your members. Download the above flier for printing and putting on noticeboards. Passing income from orders to the club treasurer to pass on to the Area Flower Arranger Officer with the appropriate form. 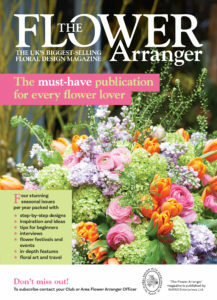 Taking delivery of the Flower Arranger magazines and distributing them to members as appropriate. Please refer to the table below for dates for last order amendments and delivery dates. Order forms can be downloaded by clicking on the links in the relevant cells in the table. Two attempts will be made to deliver to your Club Flower Arranger Representative. To arrange an alternative delivery address for specific issues, please contact Sheila Williams, Tel: 01189 403587).